Thanks to all who participated in the day we did today on the “becoming of G-d”. I am very glad that so many people found it so helpful, and that what we covered with continue in dialogue in the Anglican Diocese and beyond regarding “Emerging Church”. As we discussed, St Martins will be stocking copies of my books, particularly the second. Copies are now available for $20 CAN so if interested, please do contact Jeremy at St Martins Church, North Vancouver BC. He is happy to send copies to interested people in Canada & North America. Click here to send Jeremy an email to request a copy. 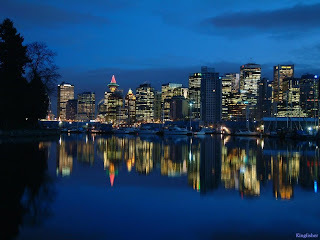 So thanks Vancouver, it has been a joy to explore Trinitarian mysticism and exploring new ways of being church with you. 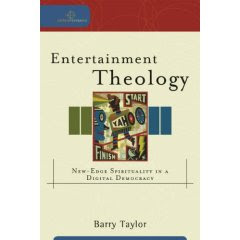 Whilst I have been travelling around in the US & Canada on my own book tour, I have been reading Barry Taylor’s new book called Entertainment Theology.It is a very long time since a theology book affected me as much as post-evangelical, but this one just has. 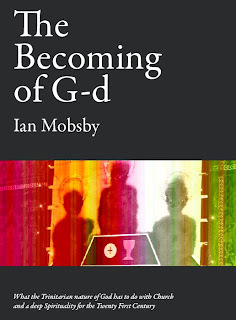 It is timely as it picks up some of the questions I do not answer in my own book the becoming of G-d, and runs to the issues and questions of what a post-secular and post-patriarchal form of Christian Spirituality looks like. It is packed full of issues that are important to be faced, many I think that relate to our proposed to move (Moot Community) to our new context. Several quotes have stuck with me. I will keep my thoughts to myself at the moment about most of this, as I am still reflecting on its consequences for me. 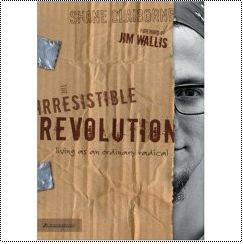 I will also be interviewing Barry about the book on the emergingchurch.info site. He quotes Glenn Frey a musician who said: The Problem with Christians is that they’ve put a padlock on paradise and lost Jesus in a bunch of bad songs. This book is about attending to the Spirit in a new age of mission, for which I think he puts it so well. I think mission might be the journey of Christians into all the world to discover the liberating mission of Jesus in transforming encounter with others, and discovery is almost always the result of adventure, creativity and risk. Without deliberately wanting to embarrass Mike & Clare, I just wanted to point out that I think Moot is entering a new phase when we again consider the question “How should we live?” which we entered when we created our Rhythm of Life drawing on the wisdom of the Monastics. This requires us to consider how we live in contemporary culture but not of the darker sides of culture. Or put another way, where are we called to affirm the good things within culture and where are we called to be counter-cultural about the things that impair healthy living and being. One of the important areas of being counter-cultural – is the whole issue of naming addiction that arises out of a life strategy dependent on consumption and the desire for affluence. Both Clare’s book, and the book Mike has recommended us to read as a community in June, not only name these addictions, but taken together, challenge us to face our Rhythm of Life elements of Balance and Presence for a start, and then into all the other elements. 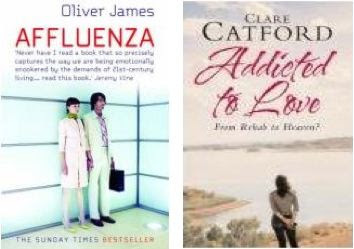 Clare’s book ‘Addicted to Love’ tells her story, and the place of Moot within it. She names the patterns of addiction she has experienced alongside God’s grace in loving her and not shaming her towards her own human becoming. Affluenza, the book Mike has suggested, takes this further, and re-evaluates the pressures on us in Western postmodern culture, and names how affluence when gained, does little more than create more stress and unhappiness. So if you are in Moot, do consider getting both these books, and we will be reading Affluenza together for June. If you have not got a copy yet, click here and Moot get’s some money against every sale. Personally, I am very grateful for the input Mike & Clare bring to our community, which is at one level very challenging and at another, incredibly encouraging and loving – with a sense of humour!! Our community would be severely impoverished without either of them. So we will be discussing this together in the new term, and the implications not only for ourselves, but for the health of our community. See the website for the term May to Aug 08. I had the good fortune to catch up with my good friend Barry Taylor today in London as he passed through. He has always inspired me, ever since we met at an event at Fuller Seminary in Pasadena. This time in our explorations over a coffee, we explored the issue of spirituality coming out of a digital and technological age. Some know that I am considering starting a PhD in this area, and I was really encouraged to hear that others are pashed up about it as well. In fact, Barry, who is always miles ahead of my thinking, has already written a book on it, which I have ordered – which looks at the whole issue of spirituality being driven by deep things within contemporary culture. It is called Entertainment Theology. I am still reflecting on the conversation, how spirituality has become the new religion, and yet, we don’t really know yet what people mean by spirituality. It is still emerging. In this book I have taken the concepts of my first book on the practice of emerging and fresh expressions of Church, and explored them in more detail and in wider application. I explore how a deeper understanding of the Trinity birthed through the early Cappadocian Church writers helps us reimagine the nature of God through a more apophatic reading. Further, I explore how the Church is called to reflect this nature of God in its form and function. In this way the Western Church is freed from its limited understanding of the Trinity, (the unfortunate Achilles heel of St Augustine’s interpretation) releasing the Church to be more pioneering, fresh and engaging through a better understanding of the Trinity, and in particular, the person of the Holy Spirit. As G-d becomes as a continuing event through human history this God reframes who we are and what Church is called to be. We are all on a journey of ‘individual human-becoming’ and the Church as a ‘transformative event of God’s love and action’. In this way we have rediscovered an ancient:future expression of the Christian faith and church in an Age of New Mysticism. I particularly explore the high view of ‘community’ held in emerging churches, in an age where being in community is hard to sustain and counter cultural. In fact many do not have the interpersonal skills to choose to live this way even if they wanted to. I therefore address how many emerging churches border on being therapeutic communities for the humanisation of its members inspired by a God who models loving interdependence. The book will be available for order soon in the US & UK through YTC Press. Continuing with my exploration of the application of Claibournes writing – click here for the first reflection. I want next to explore his ideas of abundance with the idea we have been exploring this month in Moot – the idea of ‘sufficiency’. 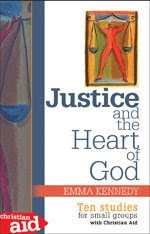 Claibourne talks about the idea of communities of justice seeking the common good, and that when you live this way – you can receive abundantly from people – in away you could not – if caught in the individualistic pursuit of consumption. I like this idea a lot – but it requires a community to really practice generosity with money. I don’t think there are many emerging churches that are generous with money – partly because they are made up of people who are bright and broke – but I still think we have a long way to go – to be more open with money and offer the little we have. I am trying to live this way – and balance the need to be a good steward with a shared purse. I hope that Moot can learn to practice its generosity more – so that we can create funds to really help people and Moot develop. We have not established this yet. This way of living is so counter-cultural that it requires a real focus to live this way, and challenges individualism. I love the stories in Claibourne’s book about how people pooled money and posessions as an expression of love – that really got me. So I think this idea of receiving abundance (not to be confused with the prosperity gospel about being faithful and then God provides), out of an attitude of generosity in giving coming out of an attitude of sufficiency – is key to Moot growing into its rhythm of life. As an end note – I was really impressed about the story of Cred Jewellery – which were a bunch of Christians who set up a company to sell jewellery – but with real ethics about fair trade and supporting ethical and justice orientated approaches to diamonds and the rest to counter a trade based on oppression and exploitation – click the link to see their story. So a theology of abundance attends seriously to Christ’s sermon on the mount about how we should live, and takes economic matters as community seriously. And seeks to build the common good. • In a church: Porch, door, font, space, nave, window, arch, organ, pulpit and lectern, altar, dark corner, behind the curtain, box for gifts, prayer board, anywhere, churchyard, spire/tower/cross and outside. • In your home: Door, living room, kitchen, dining room, stairs, bathroom and bedroom. • In your town/city/village: road, shop, pub, town hall, park, school, church, hospital, gutter, telephone box, factory and station. • In your body: Your ears, your eyes, your mouth, your insides, your feet, your hands and your mind. Beautiful. The booklet is available from Cairns Publications who also appear to do a whole range of other stuff that may be worth looking at including other prayer resources. Interestingly they also have a Small Pilgrim Places project encouraging a network of places as ‘breathing spaces’ for prayer and meditation.